Check out tips for shipping your car, including things that affect pricing, preparing your car for shipping and reviews. Sherpa Auto Transport ships vehicles for individuals and businesses. Their quotes are backed by their Price Lock Promise ensuring that the original amount quoted to ship your vehicle is the final amount you will pay. It also customizes car shipping services on a case-by-case basis for military families, college students or contractors working out of state for extended periods of time. Decide how much you want to pay with Bargain Auto Transport. No matter what kind of car you need to ship, the experts at Bargain Auto Transport will find a dependable carrier at an affordable rate. For those interested in a fast and reliable car shipment, eShip is a good choice. The company provides real time information on your car’s status so car enthusiasts can safely transport their vehicle anywhere within the United States. Ship your now offers shipping between lots of international locations, and also provides safe and reliable transportation with real time notifications. Thanks to its highly customizable quotes, Ship a Car Direct is a great option if you have unique circumstances for your move. The company provides a price guarantee so you never pay more than the quoted price. We evaluated 15 car shipping companies, and after carefully reviewing each one, identified the four best car shippers. To reach our final decision for the best car shipping companies, we looked into things like licensing and insurance information with the Federal Motor Carrier Safety Administration, which issued a consumer advisory regarding car shipping companies. We also weighed such factors as speedy delivery time and affordability against the potential for vehicle damage during transport. Finally, we sorted through car shipping reviews. Several companies ranked relatively high on our list, and our top four picks stood out in these categories: eShip for best online quote, Sherpa Auto Transport for most accurate quotes, Ship Your Car Now for best international flexibility, Ship A Car Direct for best affordability and AmeriFreight for honorable mention. Your car is a big investment. Kelly Blue Book says the cost of a new family vehicle runs from $25,000 to $33,000 with larger and luxury vehicles costing much more. The average used car is less expensive, but still carries a price tag of close to $19,000, According to Edmunds. 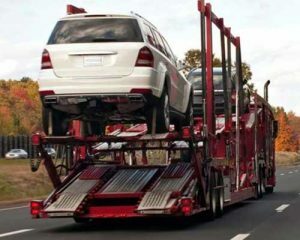 Choosing the right car shipping company will help to protect your investment, and wise buyers get more than one quote. We wrote this guide to help speed up your research, save you money, and explain the factors you need to consider when looking at various car shipping companies. For example, several elements of the shipping agreement can affect the cost. 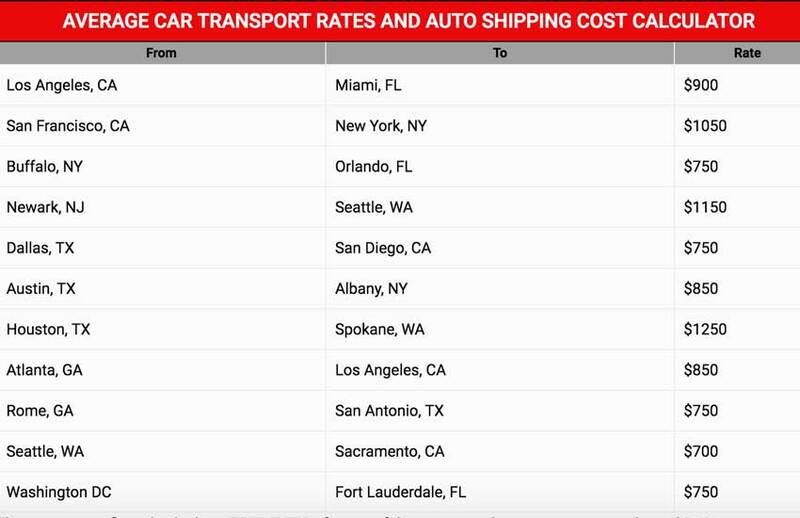 What is the actual cost to ship a car? Type/Size of Car – Cost depends on the size of the vehicle being shipping. Shipping a mid-size sedan costs around $50 more than shipping a small car; a large sedan would be $100 more. SUVs, trucks and luxury cars ship at a higher rate as well. For example, according to our research, it costs anywhere from $890 to $1,142 to ship a 2019 Toyota Highlander (SUV) from Denver, Colorado to Orlando Florida, per our five most affordable quotes. Similarly, sedans start at the lower end of that range and trucks were more expensive. We also found if you’re shipping a classic car, you can expect to add an additional $800 to $3,000 due to the special treatment required to transport it safely. Here’s a breakdown of what it would cost to ship each type of vehicle, according to our research. Again, we used Denver to Orlando as an example destination. Car Condition – If the vehicle isn’t in running condition, expect to pay around $100 if the car has no steering or braking power and between $200 to $500 if the vehicle has to be winched or moved via forklift. Shipping – Most consumers want to ship and receive their vehicle as soon as possible, but this increases the price. It will cost an additional $100 to $500 for expedited shipping. Additionally, the form of shipment – closed or open transport, affects the price. Open transport is more common and affordable than enclosed shipping. Insurance – Car shipping companies carry insurance, but the brokers who arrange the shipping do not because brokers only arrange the shipments. Get a copy of the insurance policy and read it, then discuss whether there is a need for additional protection with the company you are doing business with or with your insurance agent. Additional insurance can cost $100 to $300. Time of Year – More consumers tend to ship cars during the summer months so prices are higher at that time. Holidays and inclement weather can also increase prices by $100 to $500. Distance – While consumers understand distance affects pricing, they might not realize how much. When the pickup/drop-off location is not in a major city or it is not close to a central interstate, the cost could be double the initial quoted rate. If you need to ship in a rural area, consider finding a way to change the pick up or drop off location. Fuel Surcharges – This might be understood but it’s easy to forget about factoring in the price of fuel during your move. Be sure you get a copy of the Vehicle Condition Report when the car is dropped off. This document, similar to one you get when renting a car, describes the condition of your car when it was dropped off, including dents, scratches, mileage, and other information. Carefully compare the vehicle to the report to see if there is any damage when the car is delivered. Once you sign off on the report, your options for claiming damage will be limited. Don’t take delivery of the car at night if you cannot clearly see the condition of the vehicle. Car shipping companies handle the transportation of your car, however, they don’t typically drive it to your new house for you. It will be loaded onto a multi-car carrying truck (or ship if you’re moving internationally) and delivered to your new location, or the car shipping company’s storage depot. Here are some tips on how to prepare your car for shipping. Wash your car – Dirt and dust mask dents, dings and scratches. With a clean car, you’ll be able to notice damage caused by the car shipping company once your move is complete. Clean the inside – During shipping, your car may be placed in different angled positions. It’s a good idea to clean out the inside of your car and remove things that aren’t secure like loose change or things on your floorboard. Remove all electronics and their chargers. Disconnect the alarm – This might seem obvious but it’s easy to forget and it’ll help you stay on the mover’s friendly side. Don’t get gas – Having a full tank of gas makes your car heavier, which could affect cost and add risk to the shipment. Check for leaks – A car shipping company won’t transport your car if there are any noticeable leaks. Check the undercarriage for drips and get them repaired before moving day. Check tire pressure – Over- or under-inflated tires are just as risky during shipping as they are when you’re driving on the road. Decrease the risk of tire damage and properly inflate your tires before shipping. Remove custom accessories – If you’ve modified your car with custom accessories like a spoiler, for example, it’s a good idea to remove them prior to shipping. Modified cars are unique and increase your car’s size, making fitting them onto a truck more difficult. eShip was founded in 2012 by Craig Giganti and is headquartered in Coconut Grove, Florida. The company started out as a licensed auto transport broker with the USDOT. As a broker, eShip doesn’t own or operate any transport vehicles. It uses a network of carefully selected carries which gives consumers more shipping options and allows eShip to act as their agent during the car shipping process. eShip gives you two options for shipping your car: an open or enclosed trailer. Their website lets you track your car as it is being shipped. This live-tracking feature is available Monday through Saturday from 9:00 AM to 9:00 PM EST. You can access the feature from eShip’s homepage. eShip’s Platinum Protection Plan is included with every contract at no additional charge. This plan gives you up to $300 in added insurance to cover minor damage if a carrier’s deductible won’t cover it. It also gives you up to $300 in rental reimbursement if your vehicle is delayed more than 48 hours past the scheduled time. Read our comprehensive eShip review. Sherpa Auto Transport got its start in 2017 and ships any across town or across the country. From sedans to family-sized SUVs, to rare collectible cars and cars purchased online, Sherpa has experience in just about any type of car shipment. Sherpa Auto Transport offers open and enclosed car shipping and uses real-time data to give you an accurate quote for either type of shipping. One thing we like about Sherpa is their “no-surprise policy” which means the price you are quoted is the price you pay. Many online reviews we read backed this up. Another bonus is Sherpa’s “clean car guarantee” which means Sherpa pays for a car wash within seven days of shipment. Simply save the bill of lading from your shipment and send it and your carwash receipt to Sherpa and get a $20 credit. Sherpa Auto Transport is licensed and bonded with the United States Department of Transportation and its carries are thoroughly vetted and insured. Ship Your Car Now was founded in 2010 and is located in Boca Raton, Florida. This company is a broker providing domestic and international shipping services along with the ability to track shipped vehicles online. Ship Your Car Now has an “A-“ rating from the Better Business Bureau with 87 percent positive reviews and the vast majority of the customer reviews on other sites are positive. The company has a fully-licensed ocean transport intermediary, domestic freight forwarder and a property broker. All drivers are bonded and insured. Screenshot: Ship Your Car Now. 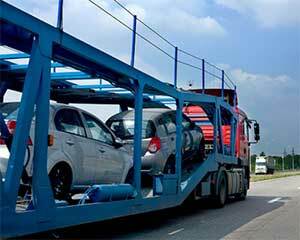 Ship Your Car is known for flexibility regarding shipping time frames and shipping options. While the company typically takes three to five days to find a driver, it can often find drivers faster for more popular routes. Shipping and delivery options include dropping off or picking up the car at a shipping port or having the company transport it to and from the customer’s front door. Ship Your Car Now does not charge upfront fees. Customers are not required to make payment until the carrier is confirmed. According to Ship Your Car Now, it can cost anywhere from $1,000 to $5,000 to transport a vehicle by ship, and anywhere from $5,000 to $40,000 to transport it by air. Shipping larger vehicles and choosing a door-to-door option can increase the price. Ship Your Car Now will also transport motorcycles and heavy equipment. Read our comprehensive Ship Your Car Now review. Ship A Car Direct was founded in 2008 and is headquartered in Niwot, Colorado. The company is a broker, which means it has access to multiple carriers that ship cars, giving consumers more shipping options. The company uses both open and enclosed transport options. 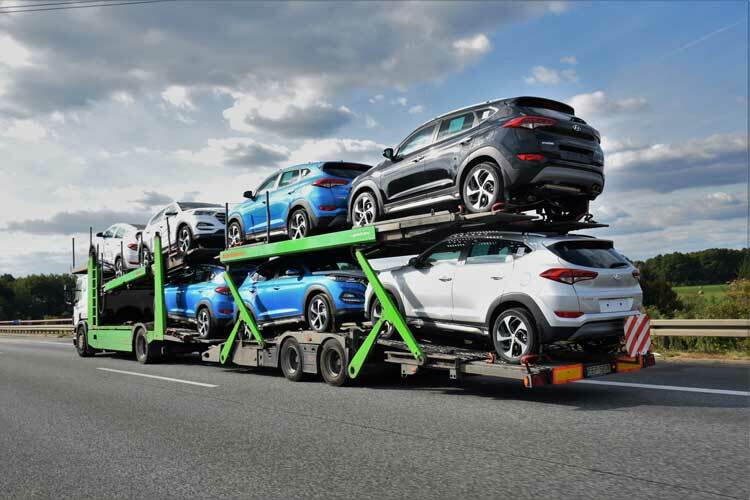 Open transport options are similar to the trucks you see on the road carrying eight- to 10- dealership cars on bi-level trailers. Cars shipped using the enclosed option are shipped in covered trailers that typically hold two vehicles. 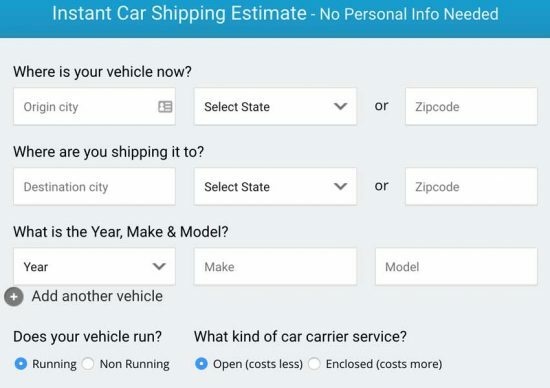 Screenshot: Ship A Car Direct. Ship A Car Direct has an “A” rating from the Better Business Bureau, and 89 percent of the BBB reviews are positive. The company has also received exceptionally positive customer reviews from a variety of other review sites and the company is insured, bonded and offers a free quote calculator on its website. Unlike most other car shipping companies, Ship A Car Direct does not charge upfront fees and payment is not due until the company has confirmed the vehicle pick-up information with the carrier. Also, the company gives customers $500 worth of free insurance in addition to the standard insurance it provides to cover any damage. Ship A Car Direct only transports vehicles in the United States and can deliver the vehicle to your home, office or other convenient location. Expedited car shipping options are available if you need the vehicle shipped quickly. AmeriFreight was founded in 2004 and is headquartered in Peachtree City, Georgia and is a broker/carrier with the ability to ship cars using their equipment or another company’s when needed. The company has an “A+” rating from the Better Business Bureau, and 96 percent of the BBB reviews are positive. AmeriFreight has also received overwhelmingly positive customer reviews on a variety of other sites. The company only uses licensed carriers approved by the BBB. AmeriFreight lists the cost of the average shipping price to be between $450 and $2000 depending on distance and vehicle size. Choosing an enclosed transport over an open transport option could increase the cost by 80 percent. AmeriFreight is a price-sensitive company offering various cost-saving options. The company’s website provides a calculator to get accurate estimates and a price guarantee so you never pay more than the quoted price. AmeriFreight also provides a variety of discounts for multiple vehicles, return customers, military and first responders, senior citizens and students. In addition, the company offers a free AFta gap insurance plan in case damage is found on the vehicle within 48 hours of delivery. AmeriFreight transports vehicles in 48 states and Canada as well as some international locations. In addition to shipping cars, AmeriFreight also ships RVs, boats, trailers, and motorcycles and works with corporate clients and consumers. The company offers door-to-door delivery. Read our comprehensive AmeriFreight review for more details. Readers of this car shipping guide also found these related articles helpful. If you’re moving overseas, you might have never thought about how you’ll get your car to your new destination. 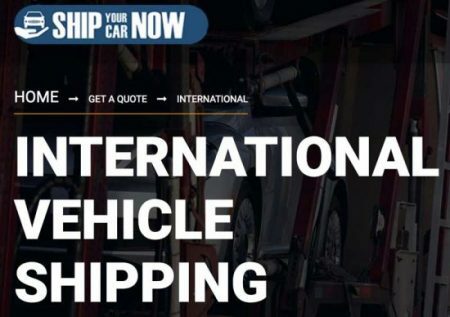 Read about how international car shipping works. Read about the pros and cons of open vs. enclosed car shipping and the types of carries for each. Buying a car online is a popular option, especially for car enthusiasts looking for specific models. Read about the different ways you can ship a car you bought online. What affects price when shipping a car? The six main things that affect car shipping price are: location and distance, type of car, condition of the car, open or closed transport, the current fuel price and time of year. Will I be given an exact delivery date? It’s rare for companies to be able to promise a specific pickup or delivery date, but most companies will provide an estimate with a three-day window. During busy seasons, this delivery window may be greater than three days. If a company quotes a specific date, get this information in writing along with the consequences of missing the date, which may be a discount or rental car reimbursement. Shipping a car usually takes around one to two weeks, depending on the distance shipped. The carrier has insurance that covers damage to the vehicle during transport. However, according to our research, one out of 20 vehicles are damaged during the shipping process outside of the transportation. AFta insurance will cover this gap. Some companies charge for AFta insurance, so ask what the car shipping company’s policy is on using this insurance option. Can my car be picked up or left anywhere? Customers can specify a pickup or delivery preference by using the door-to-door option. However, the car must be attended to by someone who will sign the appropriate forms and inspect the car before it’s loaded on the truck. Why would I use enclosed vs. open transport? Enclosed transport provides more protection for your vehicle but it’s more expensive than open transport. You can use open transport as a less-expensive option. It’s a good idea to use enclosed transport for luxury or expensive vehicles. Can I store suitcases or moving boxes in my car? It might seem convenient to put your suitcases and moving boxes in your car for transport, but it’s against the law to store personal items in your vehicle. Also, if personal items in the vehicle are damaged during transport, the company is not liable for replacement. Insurance only covers the vehicle itself. When shipping a car, whether across the state, the country or the world, it’s important to find a quality company that is willing to answer all of your questions. Consider things like distance, type of car, car condition, open or closed transport and current fuel price. Ensure that your carrier has the proper credentials and licensing and that you will receive quality service at a reasonable cost. If you need information on the best long distance moving companies to move your personal belongings, check out our moving companies guide.